The Met in HD season continued yesterday with a telecast of a new production of Peter Grimes. It replaced the 40-year old, completely realistic Tyrone Guthrie production that had served the Company well over the years. Some of my most memorable opera-going experiences involved that old production - Vickers as Grimes and Johanna Meier as Ellen Orford in 1984, and later performances involving Anthony Rolfe-Johnson and Ben Heppner. 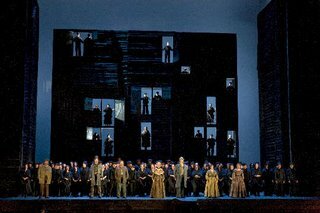 But stylistically the Guthrie production was really showing its age, so it was time that the Met retired it with a new one. The originally announced Grimes was tenor Neil Shicoff, whom I believe has sung it in Vienna. But somewhere along the way, Shicoff was replaced by the young American tenor Anthony Dean Griffey. Since I had not seen Shicoff as Grimes I can't say with authority, but frankly I can't imagine that he would be better than Griffey, who as far as I am concerned, was born to sing this role. I saw Griffey as Lennie in Of Mice and Men at Glimmgerglass in 1997, and I count that as one of the most transcendent operatic experiences of my life. So it was with great anticipation that I attended the show yesterday. In a nutshell, the musical values were equal to, if not surpassing, my expectations. Griffey was magnificent as Grimes. Having seen Vickers in this role, I must say the Canadian set the standard by which I measure all subsequent Grimes. Griffey is certainly more youthful, more likable and less menacing - less savage - than Vickers. Griffey's high, clear, sweet tenor is simply a joy to the ear, his top more secure than Vickers, and head and shoulders above that of Robert Brubaker who sang it in Toronto a few years ago. Griffey's Grimes reminds me more of Heppner than Vickers's - beautifully sung and affectingly acted, and unusually sympathetic for an anti-hero. Partnering Griffey was soprano Patricia Racette as Ellen Orford. Having seen her in a half dozen roles - among them Blanche, Tatiana and Elisabetta, I must say Ellen is probably her very best role. She totally embodies the character - I like her quiet strength and her humanity. Again, a rather youthful character that plays well against Griffey's youth. Vocally, other than a loss of focus at the extreme top once or twice, Racette sang wonderfully, her Embroidery Aria was exquisite. The third principal, Balstrode, was assumed by baritone Anthony Michaels-Moore. I was slightly disappointed by him. I find an older singer works better in this role, in the mode of a Thomas Stewart for example. Physically and dramatically, Michaels-Moore lacked a commanding presence and vocally he didn't make a big impression. He was outsung by another baritone, the debuting Teddy Tahu Rhodes, whose golden-voiced Ned Keene and handsome stage presence oozed charisma at every turn. Grimes is really an ensemble opera, with some wonderfully detailed characterizations. Standouts in this production included Felicity Palmer, who sang strongly and was perfectly cast as Mrs. Sedley. Also excelelnt was the Auntie of Jill Grove, and John De Carlo as Swallow. The quartet for the women was a highlight of the performance. Donald Runnicles proved masterful on the podium, his conducting was a perfect balance of power and lyricism, achieving great clarity in the orchestration. The Storm music in Act One was incredible (if only it were matched by the action on stage, but more about that later). And I must say I haven't heard the Met chorus sounding so good in a very long time. For years, this chorus - particularly the women - had been the Achilles heel of the Company. With the arrival of Donald Palumbo, it has slowly but surely undergone a significant and long overdue transformation. With its superb musical values, this Grimes would have been definitive if only the production itself measured up. I am sorry to say that it did not. Set designer Scott Pask's unit set is basically a soaring wall of wood panels that moves upstage and downstage, a structure that serves all three acts. It is placed quite far downstage throughout the opera, leaving a relatively small staging area, creating (perhaps deliberately) a claustrophobic and oppressive feeling. The problem with this design is its two-dimensionality. Despite the basic realism inherent in the structure, there is little that is truly realistic in the way it is used. During the storm scene for example, there is no suggestion of wind nor rain - not one person get wet! No howling of wind, no ruffled dresses. It stretches the imagination that this "wall" represents the town hall, the pub, and Grimes hut - it's really quite confusing for those new to the opera. The suggestion of scene change comes really only from the text and not from what one sees on stage. The singers and the large chorus are clustered close together up front, or perched behind various windows and doors on the multi-level structure - visually it creates a flatness that is much like a typical broadway musical, ultimately robbing the piece of its potential dramatic power. I couldn't help but compare the Doyle production with the excellent Tim Albery production for ENO that was also staged in Toronto several years ago. The latter has much more clever use of multimedia tricks to suggest the storm, and the staging for Grimes' hut - and the tragic fall of the apprentice - is much more effective. From this regard, the Doyle production falls flat, literally and figuratively. The saving grace is that the strong music values makes one overlook the design shortcomings. Perhaps some of the directorial and design elements could be altered for future revivals, although I am not holding my breath. On to the telecast itself. Shown in only two cinemas at the Sheppard Grande - and the second cinema was not full - the size of the audience was probably the smallest of all the Met telecasts so far at this venue. It was hosted by Natalie Dessay, who spoke with an accent, but she was totally intelligible. And frankly, it was a nice break from the over-exposed Renee Fleming. The interviews were pretty much standard fare - principals, director, and designer. The most interesting segment was a live relay to Aldeburgh, England - Britten's hometown - where 250 people were watching the live telecast. The transmission itself had two very minor glitches - frozen picture, each lasting about two or three seconds, one occuring at a crucial moment when Grimes struck Ellen. The audience let out a collective gasp but fortunately the transmission resumed. There were the usual ads for upcoming telecasts, and understandably Ben Heppner's name was nowhere to be seen, now that he has officially withdrawn from the March 22 performance. Let's hope the Met finds a decent replacement for Heppner. We will soon find out in a week's time! Truth be told this is my all-time favorite opera, and I can attest Griffey was born the play Grimes. Despite my disappointment with the stage set (a huge wall, with 4 stories of doors? huh? ), it was invigorating nonetheless to see such a dedicated performance. And props goes out to Runnicles, who looked just like a burly british sea captain, championing his ship amid the gales! Bravo! 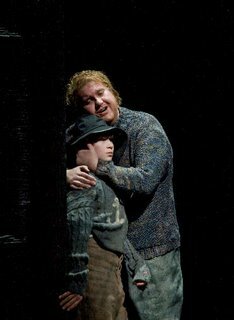 Today I saw the reprise cinema performance of Peter Grimes, so have the advantage of previous opinions. I agree 100% that Griffey (maybe 110% for him), Racette and Palmer were superb in their respective roles. As regards the scenery, I think it certainly detracted from the drama (and explicability) of Acts II and III. On the other hand, the various doors opening and closing, and people poking their heads out, added to the concept of small-town, small-minded interference in other people's affairs. Britten's Albert Herring (maybe some of his other operas too) also expresses the idea of not belonging. I enjoyed Natalie Dessay's lively interviews, particularly when she had to refer rather obviously to her cue cards! I've booked for La Fille du Régiment, and look forward to her performance.